This 15" LCD features a low price and a 170 degree viewing angle with an internal power source which frees up valuable workspace. It also features “No-Touch Auto Adjust,” which automatically adjusts many of the monitor’s display settings upon initial setup without any input from the user and works with both DOS and Windows products without special drivers. Base is detachable for use with one of our mounting systems with direct mounting to a special pad located on the rear of the monitor. 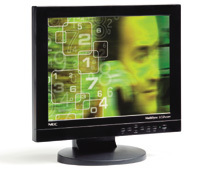 This display can be driven directly from the ST /PCU computer card without any other display hardware or software.